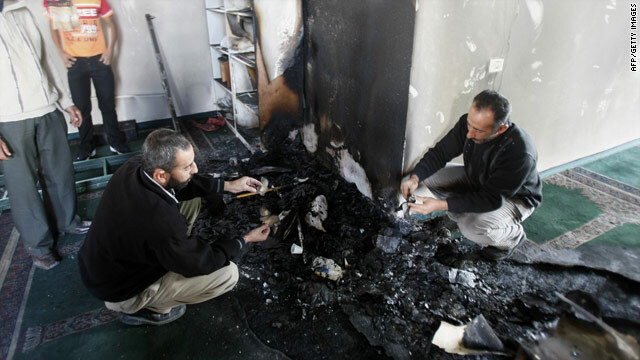 Palestinians inspect damage to a mosque that was set on fire in the West Bank village of Yasuf. Yasuf, West Bank (CNN) -- Vandals burned a mosque in the West Bank on Friday in an attack a Palestinian official said reflected Israeli settler rage over a government moratorium on settlement construction. No one knows who set ablaze and vandalized the mosque -- located in the West Bank village of Yasuf. But the governor of Salfit district, Munir al-Abboushi, told CNN he believes Jewish settlers were responsible for the attack. "The mosque was completely burned," al-Abboushi said. "They burned the praying carpets and Quran holy books, and set the mosque completely on fire, they even burned the loudspeakers where the Imam preaches inside the mosque." Al-Abboushi said the culprits had scrawled Hebrew graffiti at the entrance of the mosque that read "price tag -- with regards from Effi." "Price tag" is the expression radical Israeli settlers have used to denote reprisal attacks against Palestinians in response to moves by the Israeli government to evacuate illegal West Bank outposts. Israel's Defense Minister Ehud Barak called on the Israeli military, which occupies the West Bank, to find those responsible for the attack. "This is an extremist action that is meant to harm any effort by the government to advance political processes for Israel's future," Barak said in a statement released by his office. Settler leader Dany Dayan -- chairman of the Yesha Council, a group of Jewish municipal councils from the West Bank -- told CNN, "I hope that Israeli police will uncover the perpetrators whoever they are and will bring them to trial. This act is wrong and foolish. If this act was carried out by a Jew it fills me with great shame." Al-Abboushi said later Friday morning, after word of the mosque attack had spread, residents of the village were prevented by the Israeli army from approaching the area which resulted in minor clashes with exchanges of rocks and tear gas between the residents and Israeli soldiers. Al-Abboushi expressed doubt that the attack would be investigated properly. "What do the police and Israeli army do when they attack our holy mosques and houses? What do they do to the settlers? But when they attack us they do nothing." Last month, Israeli Prime Minister Benjamin Netanyahu announced a 10-month freeze on new settlement construction in the occupied West Bank. The move has been met with fierce opposition by the politically powerful settler movement and confrontations have erupted almost daily in the West Bank, with groups of settlers forcibly attempting to keep away government inspectors enforcing the ban.